Please find below my usual information, letters and updates on events that have taken place this week. You will notice that some of the Key Stage information is repeated again this week. Feedback from parents has indicated that it is useful to receive this crucial information each week during the exam period. Last Monday, 34 Year 8 students flew to Germany to explore some of the Black Forest’s main attractions. They stayed in a youth Hostel in the beautiful region of Todtnauberg. Highlights included a bobsled run down a mountain, testing the crazy slides in the swim centre Badeparadies, a mini walk at Lake Titisee, meeting a wide range of animals at Mundenhof Tierpark and completing a 10 Euro Challenge at Freibrug Market. Students also experienced a cable car ride on one of the largest mountains in the region, with a walk up to the viewing platform at Schauinsland. To add to the fun, they met some German pupils staying at the hostel, took part in a football match against them and were invited to their disco at the hostel. The visit was rounded off by a trip to Europe’s largest theme park, Europa-Park, where staff and students alike braved the high rollercoasters and other rides. Thank you to Ms Allender, Mr Nunn and Mr Emery for giving up your free-time to accompany us and to Year 8 for being a great and enthusiastic group to travel with - Mrs Bingham. Lots of Congratulations from Food Science this week! Year 10 students ran a stall at the Harbourside Market as part of an event with Bristol Food Connections. The preparations started the day before visiting the Fruit Market at 7am to haggle and purchase our stock. Students had decided to sell three salads, a Caribbean Coleslaw, Watermelon and Feta Salad, Fruit Salad with Raspberry Coulis, the competition was tight as we were competing against Bedminster Down, Henbury who all had different innovative ideas. Market trading was busy as it was the peak lunchtime session. We know that we sold most of our stock but we are not yet fully aware of our total profit. The week will culminate in a boardroom final when the winner of the Fruit Machine Task will be revealed. Students were fantastic and showed that they can haggle, plan and market their event and encourage potential customers tho their stall. We are very proud of Lily Booth, Diego Lovatt Garcia, Mykhell Roberts, Ihlam Mohamed ,Izara Grier they all were up very early and worked very hard to ensure the event was a success. Click here for images. The aim of the workshop is for students to understand ‘provenance’ and how game is reared, prepared and cooked. To have tasted Game, tried out some recipes and are familiar with its taste, value and uses. To take home a positive message about Game to the family shopper/cook, including its nutritional benefits and uses in a modern balanced diet. Students loved the sessions, Bod was a great ambassador for the scheme and commented how polite and enthusiastic our students are. Students loved the dish made, a pheasant breast bruschetta with horseradish mayo. Bod will be coming into school again and we hope to run further events of this kind in the coming months. Click here for images. Just a reminder about the difference between the Student and Visitor Receptions. Student Reception is accessed from the Cotham Road side of the building and is the main entry/exit route for students. It is also the reception to be used by parents/carers for any student queries, items to be dropped of or if parents are picking up/dropping off students for medical/other appointments. Student Reception is open from 8.30am to 3.30pm Monday to Thursday and from 8.30 a.m. to 3.00pm on Fridays. Please note that on Fridays only students are permitted to collect confiscated mobile phones during lunchtime as the Students Reception will be closed before the final bell at the end of the day. Visitor Reception on the Cotham Lawn Road side of the building is to be used for any parents with pre-arranged appointments with members of staff and also by visitors to the school. Visitor Reception is open from 8.00am to 4.00pm Monday to Thursday and 8.00am to 3.30pm on Fridays. Please click here to view the June edition of an Online Safety Newsletter aimed at secondary school age children. This edition focuses on YouTube. School Shoes - Trainer style shoes are not acceptable. Please click here to view visual examples of the school’s only acceptable footwear. School coats - Plain coats only without intrusive logos or brands. No denim, leather or bomber style jackets. No hoodies. School Bags - Students need a substantial school bag big enough to contain PE/Dance kit, exercise books, textbooks, a pencil case, planner and other equipment. Small strap bags, handbags and fashion bags are not permitted. Click here to view the full uniform requirements for Cotham School. Bristol Parent Carers works with Bristol City Council, NHS Bristol and other parent organisations to improve services for our children and ourselves. On Tuesday 26 June 2018 at the Trinity Centre, Trinity Road The 2018 Participation Day event will be looking at the way SEN support works in schools, the new model for social care in Bristol and workshops on the SEN strategy and Short Breaks Schemes. Please click here for more information. Cotham School would like to invite all parents to our Celebrate and Connect supper on Thursday 19 July. The event will take place from 7pm to 9.30 pm. This will be a fantastic opportunity for parents and teachers to meet one another and celebrate the amazing diversity of our school. Currently 41 different languages are spoken in Cotham and we have students representing every continent. Please join us, bring a dish to share and make some new friends. All Year 9 students will sit a science exam on Thursday 21 June at 1.45. All students are expected to be revising for this exam to achieve as highly as they can. The exam will include content from topics B1, B2, B3 / C1, C2, C3 / P1, P2, P3. All students have a login to the online textbook on the kerboodle website (password resets available from class teachers). Class teachers will also put more revision materials onto Google Classrooms to help with revision. Results will be used to determine science groups for next year. This includes which students will be offered to study Separate Sciences GCSE (formally called Triple Science). The remainder of students will all study Combined Science (formally called Double Science). Revision sessions will run on Tuesdays after school 3.15-4.15 (5, 12 and 19 June) in C202. Everyone is recommended to attend. We would like to wish all KS3 students the very best for their exams this term. End of year exams for Year 10 students will commence on Monday 18 June and continue until Friday 29 June. The results that they achieve will be sent to you in your child’s Academic Monitoring report at the end of Term 6. Your child’s end of year Academic Monitoring report will contain their Current GCSE Grade, their Exam Grade, and their teachers Predicted Grade. Teachers will use your child’s performance in these exams to arrive at a Predicted Grade. Your child will be asked for their Predicted Grades when they apply to Post 16 Institutions. Institutions will consider these Predicted Grades carefully before making an offer of study to your child. The next ‘mock’ exam for students will not take place until January 2019 and so it is important that your child’s Predicted Grades are strong enough to allow them to apply for the courses that they want to study next year. It is therefore vital that your child prepares carefully and thoroughly for these end of year exams. A copy of the exam timetable can be viewed here. A copy of the content being assessed in each of their exams can be viewed here. Students will have been given a copy of their own timetable this week. Where an exam clash exists, their own timetable will tell them on which day they will complete their exams. We rely on students carrying their timetables with them at all times during exam season and being prompt to their exams. Please discuss the exam timetable with them and check that they know where they need to go for the exam and that they are fully equipped. Support your child in preparing an exam preparation schedule so that they complete revision tasks - a template revision schedule can be found here. Ensure your child has revision guides that can help to support their learning - a list of these is here along with details of useful revision websites for each subject. Examination Command Words document here - examples of command words that students need to be confident using. GCSEpod and SAMLearning contain lots of valuable online revision activities for most subjects (log on details for these sites can be found at the end of this mailing under useful links). The additional examination preparation sessions have now begun and will continue to occur for the following subject areas on the following days. Attendance to these sessions has not been as positive as we would have expected. Please discuss these with your child and encourage them to attend if they have been invited (we wrote to all parents prior to the half term and the info has also been posted on Year 11 google classroom). During the exam period the library will remain open for students to complete revision; they need to collect a Library pass from student reception as they arrive in school. All students should be in normal school uniform and have their lanyard with them (for exam identification) whenever they are in school. Year 11 November mock exam papers and markschemes and exemplar solutions can be accessed here. February Mock Exams and markschemes can be accessed here. There is value in students re-completing these and demonstrating that they can recall knowledge previously assessed, and act on feedback already given to them to improve their original raw mark. Ensure your child has revision guides that can help to support their learning - a list of these can be found here along with details of useful revision websites for each subject. Examination Command Words document here - examples of command words that students need to be using with confidence. See the Top Tips for Parents sheet attached here which contains useful reminders about ‘what to do’ and ‘what not to do’. Please continue to encourage your child to revise over the May term holiday even if the weather is glorious! Students have been issued with their own personal final examination timetable showing their own GCSE exams and examination board rules. No further paper timetable will be issued and it is important to keep this information safe. An electronic version of their timetable has also been added to the Year 11 Google classroom page so that students can obtain another copy if necessary. A full GCSE timetable can be viewed here. A copy of Examination Rules can be found here. A Level exams finish on Monday 25 June - please ensure that your son/daughter has returned any library books and locker keys before the end of term. Year 13 leavers - please ensure that your son/daughter has informed Mrs Kempt what they are doing next year - there is a careers/apprenticeship/jobs meeting with the careers adviser on Tuesday 26 June at 11.05am in G002. All students who have no clear plan should attend - please ensure they are still checking their emails regularly. Year 12 - your son/daughter should have received their predicted grades - please ask them to see their tutor asap if they do not have them. If your son/daughter is struggling with their mental wellbeing and would like some support please ask them to see Mrs Kempt. The Wellbeing lunchtime drop in continues on a Thursday lunchtime in G208 and the school counsellor is available for drop ins on a Monday and Thursday lunchtime. If they would like some 1:1 counselling please ask them to see Mrs Kempt. Location: Rolls-Royce Bristol, Horizon Hall (Whittle Conference), Gate 7, Gipsy Patch Lane, Filton, Patchway, Bristol, BS34 7QE (for sat nav please use BS34 6QA). in collaboration with businesses across the UK, IET are hosting ‘Engineering Open House Days’ to show young people and their parents/guardians what it’s like to work as an engineer by offering special, behind-the-scenes access to demonstrate how creative, exciting and innovative a career in engineering could be. As part of this, Renishaw is delighted to be opening the doors of our Innovation Centre during the school holidays to students and their parents. The event is taking place on the morning of Friday 3rd August between 09:00 and 12:00 and there will be a range of activities to cater for children aged from 7 upwards and we will also be offering information about our careers opportunities available for young people. Please note that registration is required for this event and it is only suitable for children aged over 7; all adults must be accompanied by a child. Thank you to all family, friends and staff that attended the P16 End of Show. It was a fantastic exhibition that highlighted the hard work and talent of our P16 students across a range of creative disciplines. We wish all our Sixth Formers the very best of luck with their future careers and hope that the creative skills they have developed will be a strong foundation for whichever path they choose to take. We were overwhelmed with the amount of entries for the design competition; thank you all for your submissions! I am pleased to announce that Salu De Oliviera is our winner in Year 8 and Jess Lucas and Orla Bates in Year 7 our two runners up. Your designs are the Works of the Week. The team of three will start making Salu's design on Friday at Art Club. Feathers will be presented at The Mall at Cribbs Causeway during the summer and return to Cotham as a permanent mascot. Former Cotham Student, Georgia Bate, is currently working at In Between Time and they are looking to get people involved in THE DEMOCRATIC SET. Australian theatre company Back to Back Theatre will collaborate with individuals and groups to create the film which is made up of 15 second performance portraits made by people from across Bristol. It looks like a really fun project to be involved in and requires no previous performing experience. Plus you would be helping out a Cotham Alumni in the process! 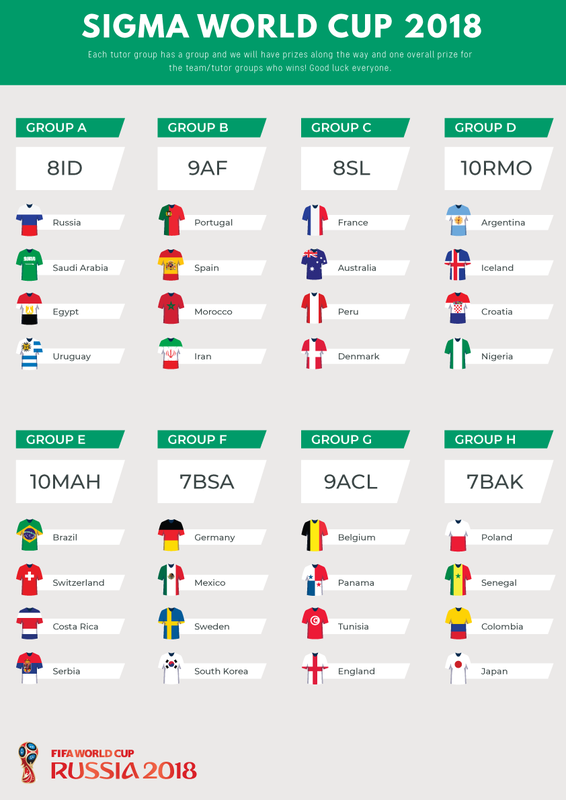 The largest football tournament started on Thursday 14 June and Sigma House will be following every game with interest. The prefects and house reps held the draw for the tutor groups to each be assigned to a Group. By having a group it means that each tutor group will take two teams to the knockout rounds. We will have prizes along the way and one overall prize for the tutor groups that wins the World Cup. Good Luck! Click here to view poster. 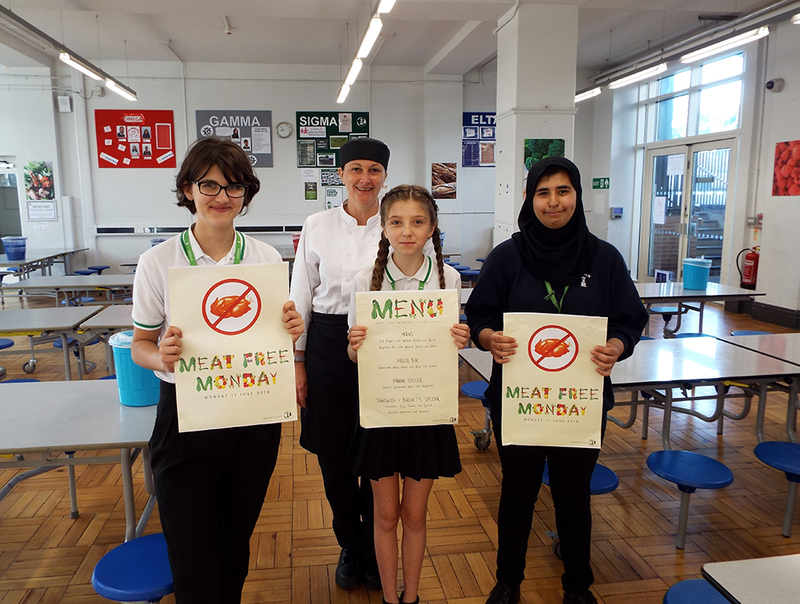 Our first Meat Free Monday was a success with lots of positive comments from both staff and students. The homemade hummus and roasted vegetable sandwich was amazing! Thank you to the school canteen for supporting us with this event. We are hoping that we will be able to continue and have more of these events. Brunel's SS Great Britain to invite students and their families to a free family event designed to inspire them with science and engineering. Called 'Explore Engineering' the event takes place on Tuesday 19 June (6.30pm to 8.30pm) on the historic ship the SS Great Britain and in the surrounding dockyard on Bristol's harbourside. It is a fantastic opportunity for secondary school students to meet inspiring scientists and engineers, take part in hands-on activities and explore the amazing opportunities available in these exciting industries. In particular we would like to encourage young women to come along and find out more about science, engineering, technology and maths (STEM) and hear real-life examples of how these careers work in practice. They will have a chance to meet representatives from local STEM companies, as well as our own Ship's Conservation Engineer, Nicola Grahamslaw, who is a Chartered Mechanical Engineer. This event is part of Bristol's Deeds Not Words programme marking 100 years since the first women were given the vote in the UK. As part of this, we are celebrating and supporting the role of women in science and engineering as currently less than 10% of professional engineers and fewer than 15% of engineering students in Britain are women. The event also takes place in the run-up to International Women in Engineering Day on 23 June. With 3 days booked in one week, receive a 4th FREE day to use at time during the summer (subject to availability).